You may have been hearing a lot about Euro 4 lately, but what is it and how it will affect you? A long time ago, the European Union decided that gases from exhausts are toxic and dangerous to both people and to the environment. So much so, that since this decision, emissions from exhausts require strict regulation. These regulations set the acceptable emission limits for all new vehicles being sold within the European Union and European Economic Area. The standards get tighter at each stage and differ depending on the type of vehicle, for example; cars are currently Euro 6 while Motorbikes are Euro 4. The Euro 4 regulations for bikes are, as you would expect, tighter than Euro 3. More care and consideration has to go in to the design and engineering of the bikes in order to reduce the amount of harmful emissions whilst not impacting on performance. Exhaust emissions are not the only aspect of the vehicles that will come under intense scrutiny with Euro 4. Fuel vapour contains unburned hydrocarbons which can escape when filling your tank or by accelerating. By adding Electric Fuel Injection (EFI) systems to new bikes, the amount of fuel being used is controlled, reducing the amount of hydrocarbons escaping to Euro 4 standards. 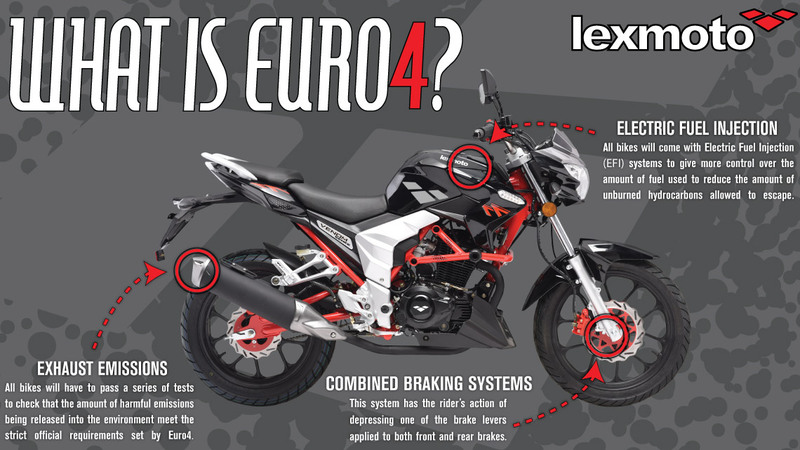 New bikes will also have to have on board diagnostics (OBD) systems fitted as well as either ABS or a linked brake system in order to pass Euro 4. The OBD measure and record the status of emissions management systems to ensure the bike stays within Euro4 limits, whilst the braking systems give the rider more control, increasing overall safety. All this may seem daunting to new riders but when buying a bike, all the leg work has already been completed. As the rider, you just get to enjoy the benefits and the thrill of the ride without having to worry. If you have any questions regarding Euro 4 regulations, contact your local dealer and they will try their best to answer them.